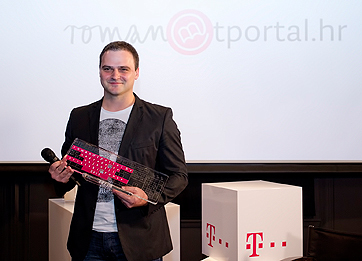 The writer Kristian Novak has won the roman@tportal.hr award for his novel "Črna mati zemla" published by Algoritam. He was presented this prestigious literary award worth 50,000 HRK at yesterday's award ceremony held at Europa Cinema in Zagreb. Recognizing the importance of investing in culture and granting awards to writers, one of the most-visited web portals, www.tportal.hr. established this award seven years ago. This year's competition saw the participation of 49 titles, which is the highest number of applications throughout the seven years since the foundation of the Tportal Literary Award. The last year's winner was ‘Budi Hamlet, pane Hamlete’, the first novel by Tahir Mujičić (AGM 2012), and other winners were 'Adio kauboju' by Olja Savičević Ivančević (Algoritam 2010), ‘Tri’ by Drago Glamuzina (Profil, 2008) and 'Anastazija' by Dalibor Šimpraga (Durieux, 2007.). The year before last, the award went to Ivica Đikić for the novel 'Sanjao sam slonove' (Naklada Ljevak 2011), and this year's competitor Sibila Petlevski was also among the award winners. She had received the award for 'Vrijeme laži' (Fraktura, 2009), the first part of the ‘Tabu’ Trilogy, from which the second novel ‘Bilo nam je tako lijepo’ went to the competition's final two years ago. The decision on the winner of the competition was passed by a jury of independent literary experts comprised of: Jadranka Pintarić, Katarina Luketić and Miroslav Mićanović. The award was presented to the winner by the president of the jury, Jadranka Pintarić, who explained: "This year, we were looking for something fresh and wondrous, for refinement in details and for challenges in style and language in which we identify the author's passionate effort, instead of the "lightness" of writing sentences. And this is exactly what we found in Kristian Novak's novel "Črna mati zemla“, this year's winner of the novel of the year award." The award ceremony was also attended by Mrs. Andrea Zlatar Violić, Minister of Culture of the Republic of Croatia, and Mr. Davor Tomašković, President of the Management Board of T-HT, who took this opportunity to say "Hrvatski Telekom, being a socially responsible company, is supporting cultural projects, as also demonstrated by this award. By this award we wish to reinforce the social status of established literary names, but also present an opportunity to new authors and contribute to the creation of new literature lovers. My thanks go to everyone who has participated in our competition, and I would like to invite Croatian authors to apply with their work again next year."